"This cheese crusted quiche is great with a salad and crusty bread!" Line a quiche dish or 9 inch pie pan with the 8 ounces of Muenster cheese slices. Carefully press all of the water out of the spinach and place it in a large mixing bowl. Add eggs, Parmesan cheese, cream cheese, salt, pepper and garlic powder; stir well. Spoon mixture into pan and top with remaining cheese slices. Bake in preheated oven for 35 minutes and allow to set up for 10 minutes before serving. Decrease oven temperature by 25 degrees F if using glass pie dish. 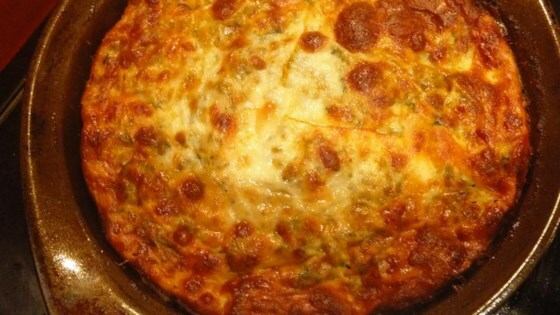 Im on a no carb diet and make this once a week! its wonderful!